Barry's Meat Market: as one door closes, two open! Saturday 26 May will see Barry's Meat Market, the mainstay of Woodgrange Road's retail offer, close its doors for the last time - but other portals are opening soon! As a thank you present to his loyal local customers, Barry will have a marquee at the back of the shop on the day, with a barbecue and drinks for them, between noon and 5pm. You are welcome! The closure is a prelude to the redevelopment of the shops and flats above 39a - 49a Woodgrange Road, to make way for the construction of 77 new flats on the site - and the opening of a large Lidl supermarket (see here, for details). Three of the shops on the terrace have already moved south down the road (Khan, the halal butcher, Medinah's dry cleaners and Fancy Curtains), and the painted-over windows suggests that Gregg's has already sold its last local sausage roll. Barry's is migrating too - but to the 21st century and the web! More of that later. 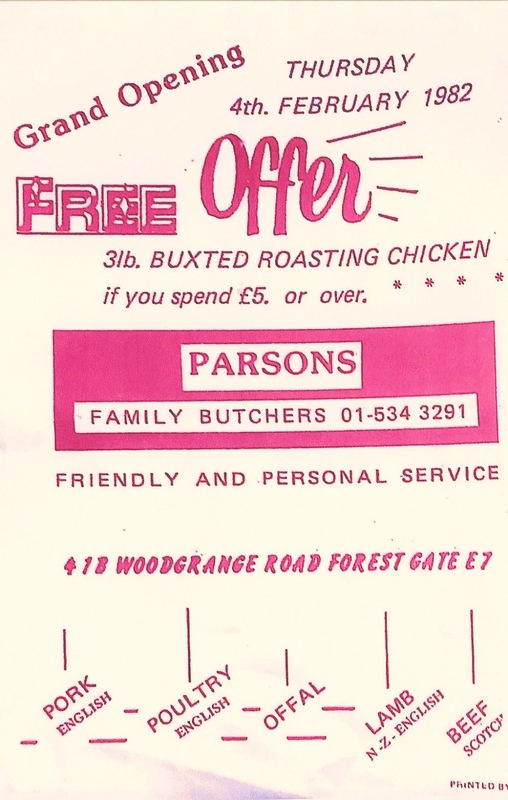 Barry Parsons was born in Walthamstow in 1969 and opened his first butcher's shop on Woodgrange Road, with family help, as a youngster in 1985. It was in a small shop, next to Santander (in what later became Fancy Curtains), which had originally been opened as part of the family business in 1982. Due to family illness it closed temporarily in 1984 until Barry stepped in, the following year. 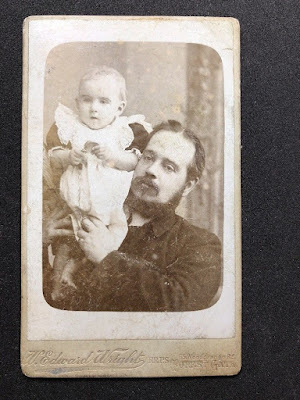 His dad, a bus driver, and granddad, a butcher, opened the first in the line of family shops (the title family butcher's always seems somewhat sinister! )in Lea Bridge Road in 1970. The name above the door was Parson's - and it remained so until about five years ago. The shop was later moved to Walthamstow High Street, and it is today run by Barry's cousin and trades under the name of Norfolk's. Barry's older brother, Jeff, meanwhile opened his own butcher's, the Cookery, in Stoke Newington High Street, 40 years ago - where he is still in business with it. Barry started working with Jeff and after three years, branched out on his own, to his first Woodgrange Road shop - 41b, in 1985. Three years later he moved to his very familiar corner shop. And, of course, he's seen many changes, over the years. 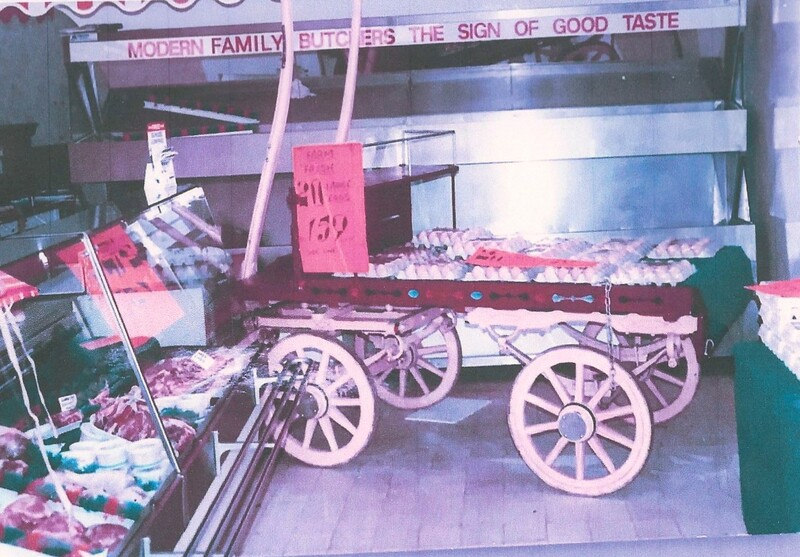 When he started there were seven butcher's on the street, including a Dewhurst's an AA Fisher's and a Manor Farm Foods. Since that time the shop has faced many challenges: the rise of supermarkets and pre-packed meat, the impact of convenience and take-away food, the emergence of halal competition locally and the rise of vegetarianism - all of which have hit the traditional butcher's trade. One of his biggest challenges, however, came from an unexpected source; Thames Water. Readers will remember when the land outside his shop was dug up for almost three years, as major work was undertaken on the main pipes and sewerage systems below. This hit his trade badly, as customers found difficulty in accessing the shop - and others simply assumed it had closed. Sales dropped by about 60% during the works and it took Barry many months to extract compensation from Thames Water for the damage it had done to his trade. Barry's has survived, because he has moved with the times. 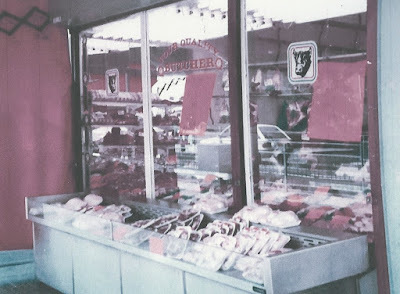 A look inside his shop shows that the stock caters for the meat tastes of most of the local nationalities who have settled locally; and his staff, ethnically, almost mirror the community they serve. His motto is - listen to your customers, and give them what they want - in short, the cornerstone to all successful retailing. It's a hard life as a butcher. Barry, who now lives in Waltham Abbey, is up five days a week at 3a.m. to get to Smithfield for 4, each day. He's back at his shop, fully loaded up with meat between 5.30 and 6 each morning. It's then cutting and preparing time, before doors open at 9. It's usually 6.30pm before the shop is cleaned up and ready to close for the night. Work "in the office" then begins for Barry, as he begins making his orders for the following day and balancing the books, before he can shut down for the night, and grab 4 hours sleep, before the schedule begins again. When a bad accident to his arm kept him away from his shop, about three years ago, Barry began experimenting with new business models - and that has prepared him well for his future in the trade. He has had little choice but to move his business from Woodgrange Road on, as his lease has been run down, and the freeholders have sold the row of shops and premises behind them for redevelopment. He has tried to maintain a local presence - making an unsuccessful bid to take over another shop on Woodgrange Road, and has also acquired premises further up - near the fish supermarket, to redevelop as a butchers'. Difficulties with the planners - now resolved - however, have meant that it would be 18 months before he could trade from there. So - the business models he learned from his time away from the butcher's block have come in very handy. He started and developed a wholesale meat business, working with a chain of Lithuanian butchers, which is prospering. This augers well for the future. He also started, by way of an experiment, a high end, on-line, butcher's shop. This has been revamped, and will be relaunched as The Luxury Meat Box Co (www.TheLuxuryMeatBoxCompany.co.uk) in June. He will also be continuing to operate - on-line - as Barry's Meat Market (www.BarrysMeatMarket.co.uk), where he will offer a four day a week delivery service to Forest Gate, and his local customer catchment area. 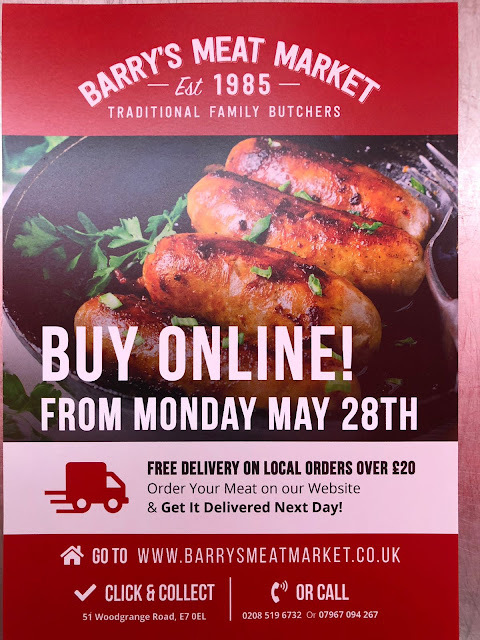 Barry's on-line will be available from Tuesday 29 May - there will not be a day of lost trading, after the physical shop closes! The company's website even has the feel of Barry's shop about it - with the signage and colouring. Barry's will offer next day (Tuesday - Friday) delivery, free of charge (subject to a £15 minimum order) to the Forest Gate area. It will sell the same range of stock currently available, in the shop, and customers will be able to order on-line from photos of items and an easy to access ordering system on the website. Enhancements to prepared-meat quality are being developed, as the stock will become gluten-free and contain no additives. A seamless local service from Barry's. Food delivered to your door from early next week! The Luxury Meat Box Company will be aimed at the Ginger Pig, Borough Market- and other high-end butcher's chains' customer bases. Barry will be offering luxury products at affordable prices. The meat will be sourced from a range of farmers with whom he already has business dealings, together with existing Smithfield specialist suppliers. There will be Rare Breed, Angus, English Longhorn and British White beef; free range Gloucester Old Spot pork; Salt Marsh Lamb and Packington's free range chickens, among other delights, available. The meats will be dispatched four days per week, on the day of sourcing - with next day deliver, via DPD, guaranteed. It will be delivered in carefully- sourced containers and packed in ice that will keep the meat cold for four days, from despatch. The service will be nationwide - and delivery will be free for orders in excess of £60. Barry now lives in Waltham Abbey and has taken over an industrial unit there, which is currently being converted into a customised, cold storage butcher's unit. All of the preparation of meat - collected from farms and Smithfield - will be undertaken and despatched from there. Work is still being undertaken on preparing this unit. Until then, Barry will take over a temporarily vacant premises at Smithfield for his preparation work. Barry currently employs six staff - four of them will follow him into the new 21st century butchery business, leaving behind many happy memories of their time on Woodgrange Road - including one last fling, as on-watchers to a new movie. Three weeks before the shop closes, it shut for one additional day, to become a film set for a movie, staring Helen Mirren and Sir Ian McKellen. The fascia board name was changed to Rastakovski, a Polish butcher' set at the turn of the 20th/21st centuries. The film, The Good Liar, will be released by Warner Brothers next year. Helen Mirren wasn't on the set of the day of shooting, but McKellen and Jim Carter (butler from Downton Abbey) were. As Barry says, the movie will be something to show his grandchildren and tell them of his times on Woodgrange Road. So - farewell - and a swift hello to Barry, as he moves from the physical to the on-line local butcher! Barry's back. He will be re-opening in Forest Gate on Tuesday 9 October at 34 Upton Lane. There will be big discounts - of upto 50% - during the opening week for old and new customers. The shop is being refitted, and has a new name board, as opening day, Tuesday 9 October, approaches. 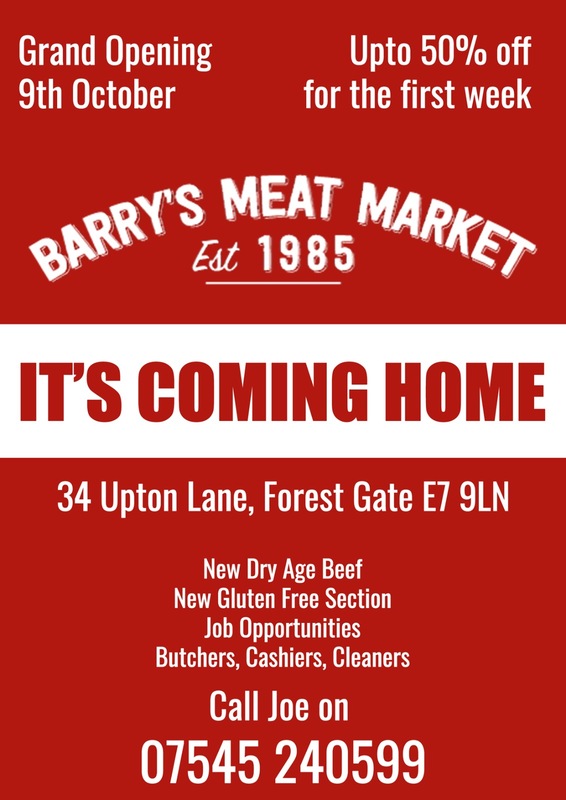 Because Barry is moving back to E7, his click and collect, via Angie's and local delivery arrangements in the area will cease with the new opening. His rare breeds meat service, however, previously available only on-line will be available from the new Upton Lane shop! Go along, and take a butcher's, next Tuesday! E7-NowAndThen asked Jane Williams of a recently established local charity aimed at supporting young mums in desperate straits to tell us a little of the charity's background and record. It has achieved the unwanted status of being a success in an arena that should never exist. Please offer The Magpie Project your fullest support, however you can. E7 is a place of increasing extremes. Houses selling for pushing £1m sit cheek by jowl with houses in multiple occupancy and bed and breakfast hostels where families live in appalling conditions - without access to the basic amenities of a safe, clean kitchen or bathroom. 'Gentrification' of the area has seen families unable to afford increasing rents being forced in to worse and worse living conditions. Newham also holds the unsavoury honour of being London's top borough, in terms of families in temporary accommodation. As with most inequality and poverty, women and children tend to suffer first and most and longest. A recent Society Guardian investigation revealed that towards the end of 2017 there were at least 26,152 under-fives in temporary accommodation in England alone, 2,341 of them living in B&Bs. Newham's own housing department accommodated 1,996 under-fives in temporary accommodation in December 2017. Please don't stop reading. This is not an article running down E7 - on the contrary, this is a love letter to Newham in general, and Forest Gate in particular. The idea behind the Magpie Project was simple. Those mums living in the dire circumstances of temporary accommodation, hostels, refuges or sofa surfing - were simply not getting to our local children's centres with their under-fives. We worked with Kay Rowe Nursery and Children's Centre (one of our best early years providers, rated 'excellent' by Ofsted) to make sure that every child had the chance of benefiting from children's centres. So, for mothers whose lives are too complicated, those who don't have the bus fare, those who don't have the information, or feel too low or judged to engage - we wanted to come up with something. We set up a simple play and stay, offering a friendly, non-judgemental, non-threatening space for mums to come with their under-fives. We want to be a place where mums can get tea, coffee and chat to others in the same situation. Somehwre their children could play, have a healthy snack and lunch. We pay the bus fare, and while mums are with us - we bring in professionals from housing, immigration, health, employment and domestic violence services to help them begin to address the issues affecting their lives. It was nerve-wracking back in June 2017, when we opened for the first time. Volunteers and professionals sat in the room and waited for mums and children to come. Eight months, and 127 mums later - we get more than 20 families every time we open the door and an average of three new families a week come to us for help. So, we kinow we are on to something. 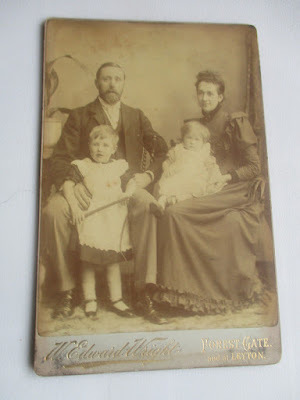 But what has been utterly astonishing is how YOU, Forest Gate and Newham, have taken these families to your hearts. What has been utterly extraordinary is that - the moment we started to talk about this - the vast majority of you responded with; "What can I do?". And you did - do, in so many ways. You volunteered to run the stay and play, to make soup, to donate printing, clothes, to paint faces, to bake cakes, to run errands, to deliver leaflets, to donate baby equipment, toiletries, nappies and so much more - to come and share your skills and passions with our families at workshops. More of you came forward with ideas for fundraising and a desire to give money. Local charity, Community Links, helped gain our first funding. Aston Mansfield (Durning Hall) gave us a room for free and helped us with training and capacity building. landlord out of the public purse. is now in a nicer (still temporary) home. East Edge Sisters and Forest Gate WI fundraise for us. Woodgrange Market cake stal, veg stall and Anagram Antiques have all supported through donations and raffle prizes - and the wonderful Jeff and Andi at Number 8 Emporium have designed and sell a range of jewellery, just for us. The support and love that Forest Gate and Newham families have extended to our own most vulnerable families and under-fives has been extra-ordinary and truly humbling to witness. And it goes on. There are plans afoot for a first anniversary fund-raiser, a summer extravaganza and, of course, a deepening and widening of the help we give to the homeless under-fives. There are more than 1994 under-fives in Newham with no stable home. We have only seen 150 of them. So, our work is only beginning. With community support like this - we hope they will be in safe hands. Below is just one example of the kind of situations the women we are working with face, in an effort to provide the simplest of needs for their children. When D came to us in June 2017. She was living with her four children on the sofa of a friend. She had no recourse to public funds and was surviving on £37 a week from Newham Social Services. 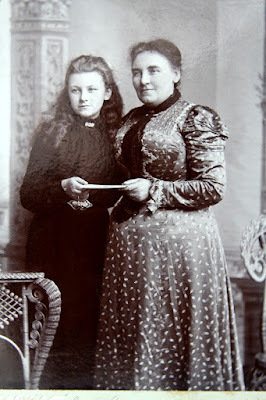 Her children were hungry and she was in extreme destitution. We supported her, first practically by supply emergency funds through South West Ham Children’s Fund, and food bank referrals, getting hold of clothes, food, and equipment for her. We then supported her to challenge the level of support she was receiving, through the recently retired ex Councillor Dianne Walls. Shelter took on her case, as she was moved into temporary accommodation of her own. She then had her case taken on by London Black Women’s Project and in February 2018 her indefinite leave to remain in the UK was granted. With the help of the family support worker that we introduced her to, at the local children’s centre, she has now applied for all benefits due to her. She is actively seeking work, through agencies, in residential care homes. D and her four children have been rehoused in Manor Park. We cannot claim credit for these outcomes but we did support, enable, inform, connect and walk with D while she solved her own family’s issues. She is now a founder member of our steering committee, she has introduced volunteers and other families to the project. She is a beacon of hope for the mums who are still in difficult situations. to us exceeded all our expectations. find so many families "sofa-surfing"
· Hundreds of beautiful baby clothes. · 2 families’ NRPF decision reversed with the help of The Unity Project. · 5 families received their indefinite leave to remain. · We always need toiletries, sanitary items and oyster cards. · Pick up and drop offs. · Spread the word in person or on social media. · Talk about homelessness to everyone who will listen! · Consider housing, childcare, early years education and domestic violence policies when voting. We were contacted a while ago by Chris Roach, the Great Granddaughter of prominent Victorian and Edwardian Forest Gate photographer, William Edward Wright. Together, we have put together this article on the interesting life and work of this local entrepreneur and innovative photographer. He opened eight photographic studios in Forest Gate and west Essex in the thirty years between 1880 and 1910, and later, a further studio in Westcliff-on-Sea, Essex. Below, we examine his life and works, amply illustrated by many of them. 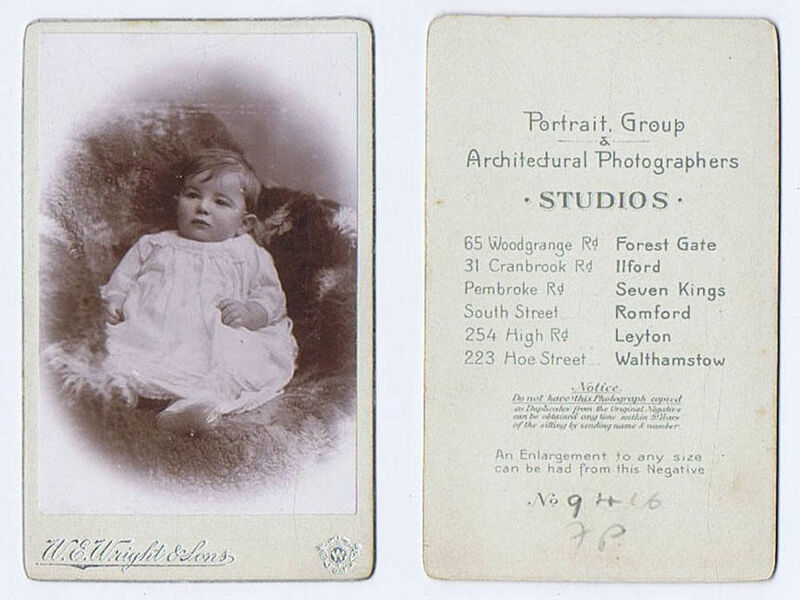 William Edward Wright was born in Poplar in 1852, the son of a "colour maker". 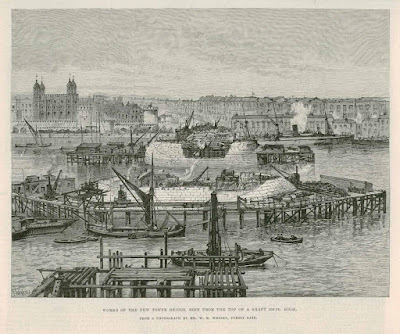 By 1861 he was living in High Street, Stratford, and given his occupation, his father probably worked in one of the then "stinky industries", based in what is now the Olympic Park. 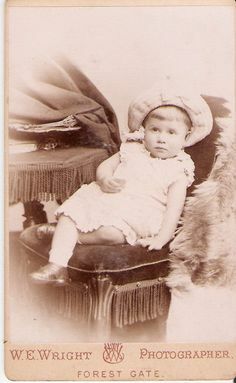 A decade later, William was an 18-year old "head of household", living on The Broadway, Stratford, in "fancy sales" (small decorative gift items). He married Sarah, two years later. 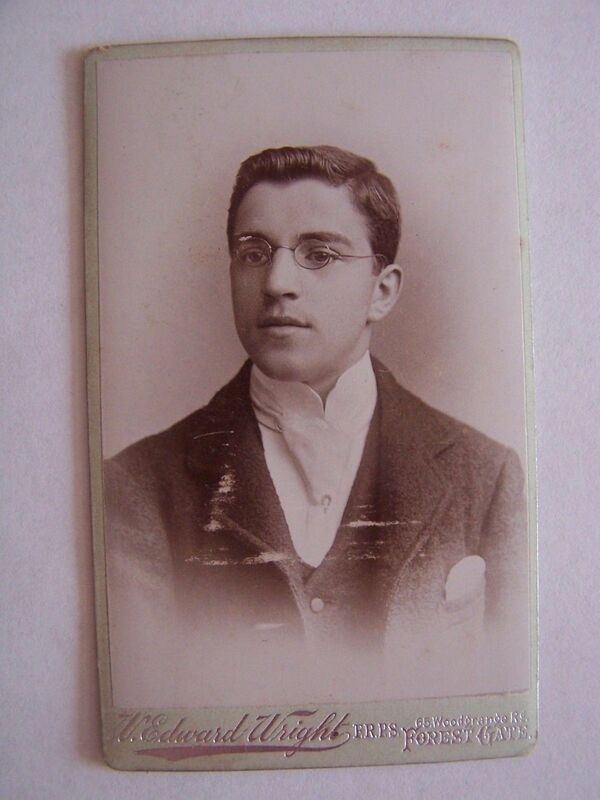 In 1881 (aged 29) he was living at 3 Somerset Terrace in Godwin Road and had two sons. He was, by now, listed as a photographer. 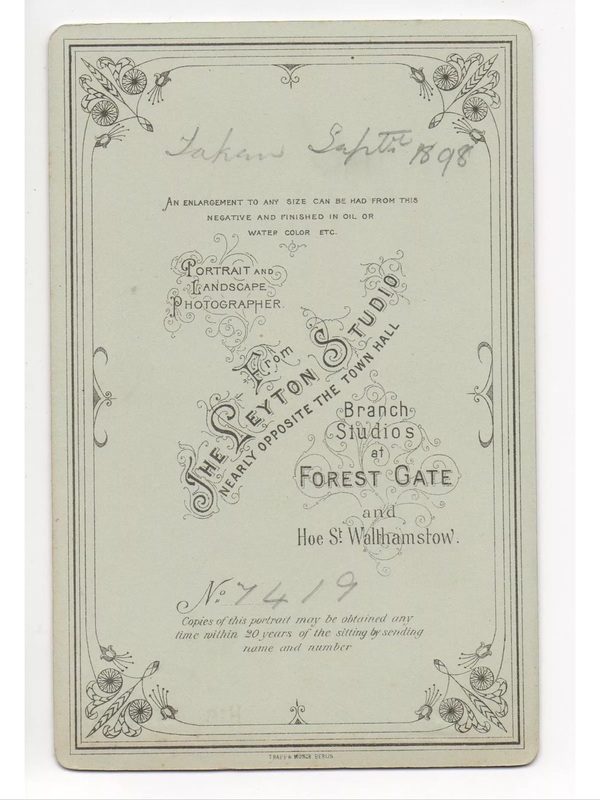 It is not clear where he was working then, or for whom, but a year later (1882) a Kelly's trade directory shows his premises to be a short distance away, at 1 Sebert Road, Forest Gate. 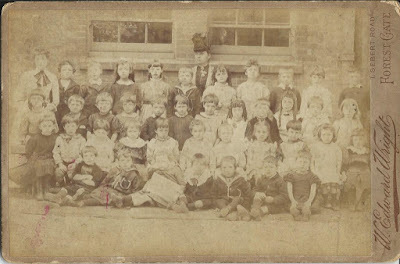 The 1891 census indicates that the family had relocated to also live in the Sebert Road premises (see contemporary photograph). By now there were three sons in the family, and it was prosperous enough to employ a domestic servant. 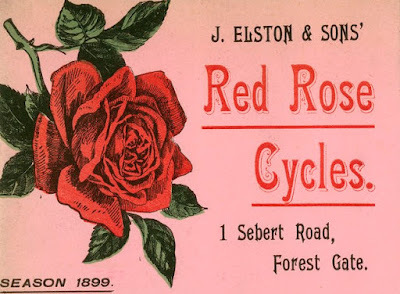 The Sebert Road premises was spacious and has been used, over the years, for a number of light industrial purposes, including for a while - after the Wrights left - at the turn of the twentieth century, as a cycle manufacturers (see photo). W.E. Wright was clearly on the up, as a photographer. 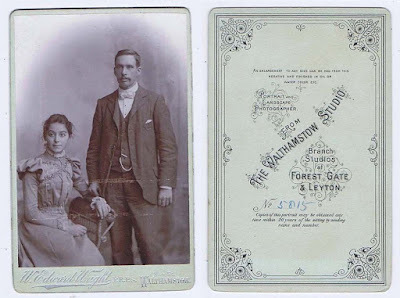 By a 1896 he had moved business premises to the better located 65 Woodgrange Road - on the, by now prosperous, Forest Gate high street, just a couple of doors from the railway station. 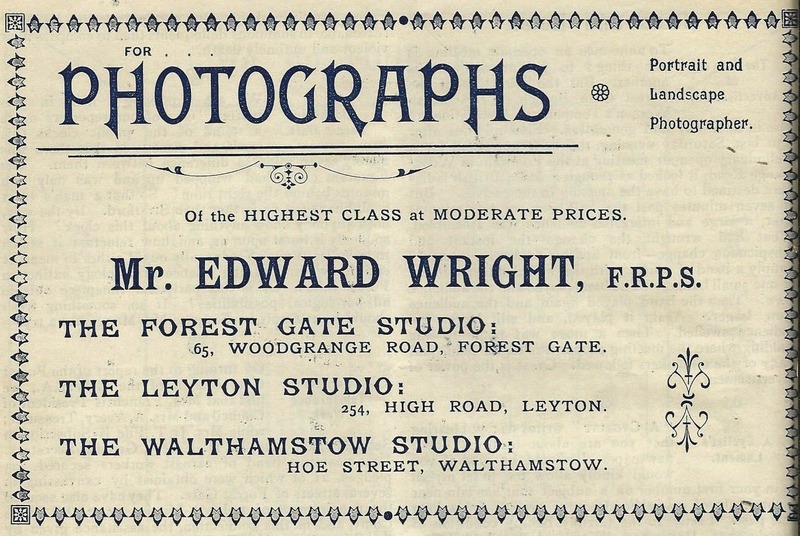 Wright had also opened up other branches of his photographer's in Leyton and Walthamstow (see advert from the Forest Gate Weekly News of 1896). 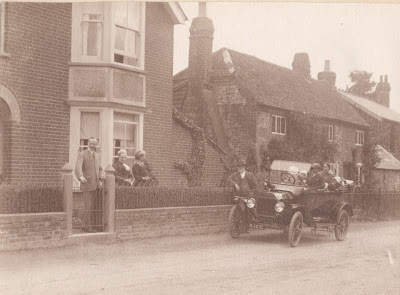 The studio/shop's sign in Woodgrange Road can be seen on the undated photo, below. This building was bombed during WW2 and is now the site of a Halal butcher (see recent photo, also below). position next to the railway station. 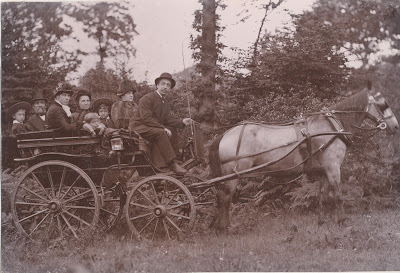 The family were living above the Woodgrange Road at the time of the 1901 census. 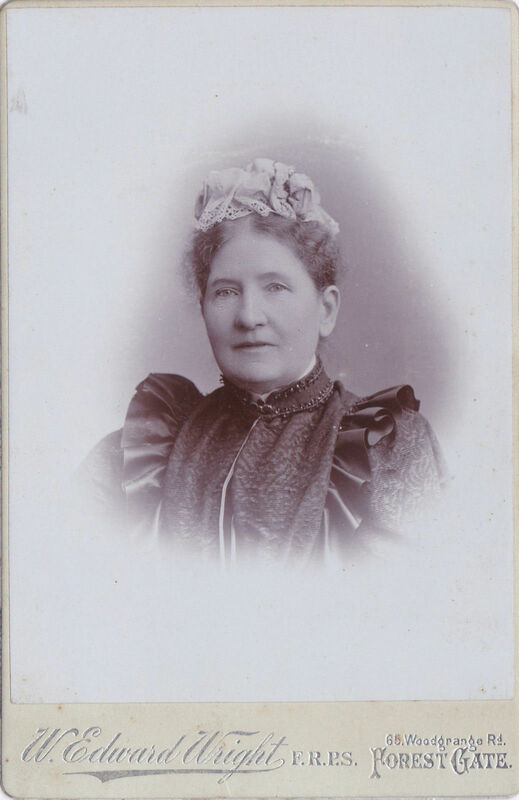 All three sons were, by now, "photographic assistants", and their income clearly helped family finances enough to enable them to employ a cook, in addition to their general "domestic servant". Although only 59 William, had retired by 1911, and with his wife, Sarah had moved to Cambridge Road, Southend. They retained the services of a domestic servant. 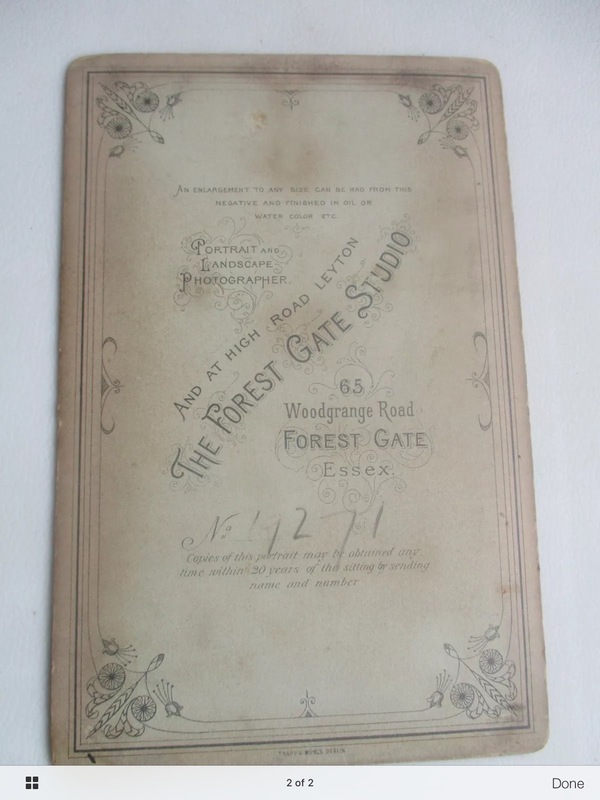 Despite the fact that William and Sarah had retired to Essex, trade directories indicate that his Woodgrange Road studio was still operating, presumably under the management of one of his sons, until at least 1922. 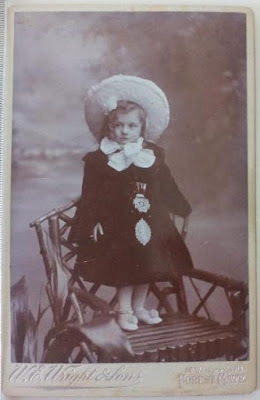 His great-grand daughter believes that many of the studio premises remained with the family - albeit, some with changed functions, until after Charles died in 1963. (We would be delighted to hear from any reader who has recollections of the premises in its latter days in family hands). 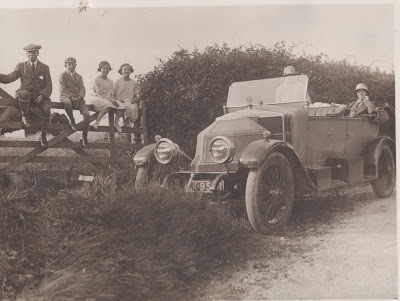 William and Sarah had three sons and the youngest - Charles, blog collaborator, Chris' grandfather - became a reconnaissance photographer during WW1, going up in biplanes taking photos on glass plates. 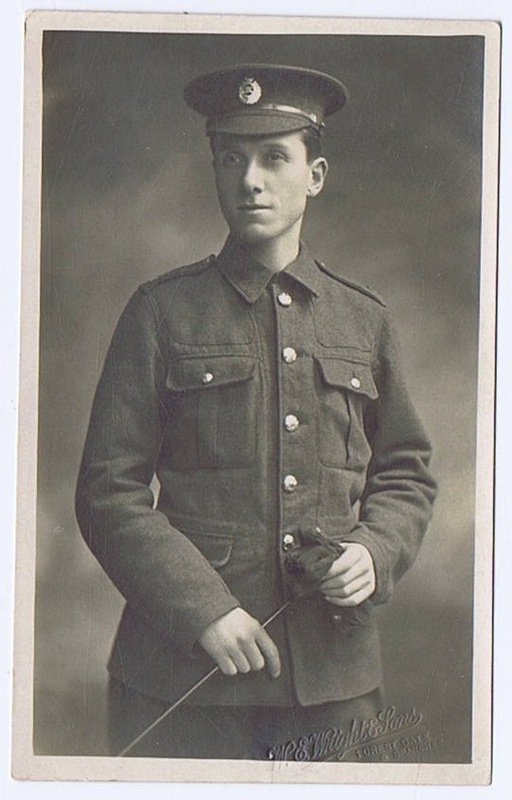 He joined the Royal Naval Air Service (RNAS) in April 1917 and rose to the rank of sergeant. He transferred to the RAF on its inception on 1 April 1918, as the subject of the merger of the RNAS and the Royal Flying Corps. See below for some of the photos taken by he and his colleague D Hardee, at the time. The most spectacular (the German fleet, having surrendered, being escorted along the River Forth), was Hardee's. to accompany the surrendered fleet. Photo taken by D Hardee. Ariel photo of the fleet in convoy. taken in training of a bi-plane dropping a torpedo. Theoretically Charles shouldn't have kept these photos as they were "classified", but his desire to retain them as souvenirs is understandable! His son, Alan, later sent copies of them and others to the RAF Museum at Hendon and at least one of them can now be seen on display. In one of those odd twists of fate, Charles became an air-warden, during WW2. After WW2 Charles, grandfather of co-blogger Chris, went into a related work area - optics. 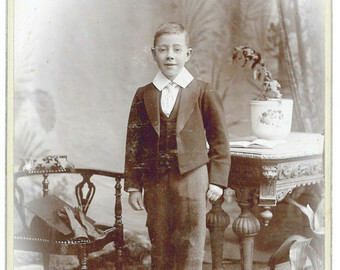 His son, Alan, followed him as an optician in Hamlet Court Road, Westcliff, the area to which William moved after WW1 and where he established his last studio. 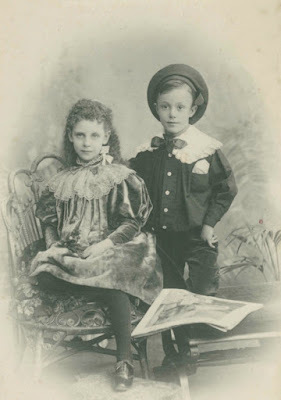 The coming of box brownie cameras and home photography meant people no longer used photographic studios to the same degree. 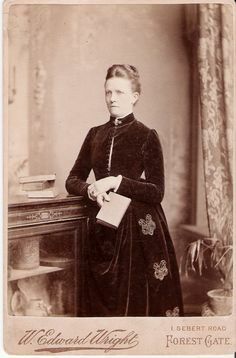 They have subsequently diminished in number, and with their demise, the Wright family's involvement as professional photographers. 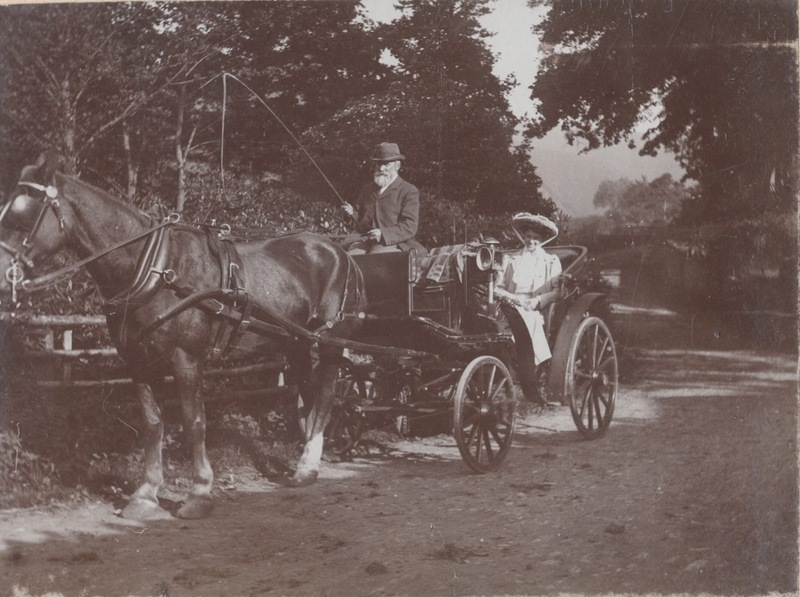 What follows are small collections of William Edward Wright's work as a photographer, interspersed with details of the locations of his studios and some of the styles that he adopted and captured. The family loved to travel in style and the Wrights certainly captured that in photography. 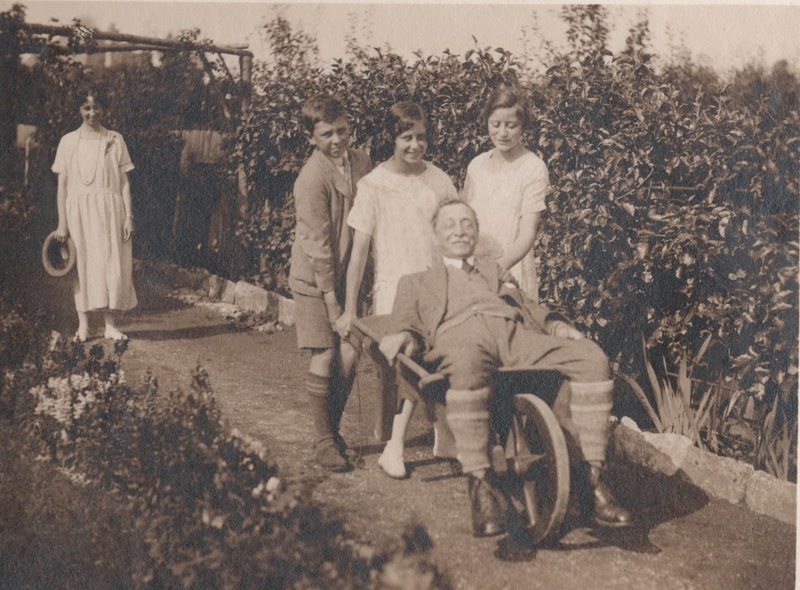 Many of those below feature members of his own family - including the wheelbarrow one! After 1906 - local branches were established in Pembroke Road, Seven Kings and at 31 Cranbrook Road, Ilford, as well as in South Street, Romford. Later, a branch was opened at 162 Hamlet Court Road, Westcliff-on-Sea. by his grandson, who was by now an optician. an optician called CE Wright! 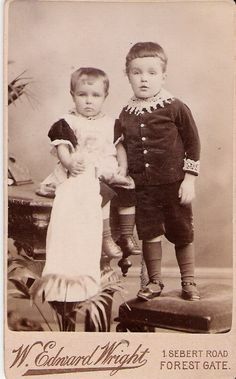 Most of William Wright's surviving commercial photographs are what are technically known as CDVs - from the French Carte de Visite - or visiting card. They often become available on EBay. The photos are of a fairly standard size - approximately 4.25" x 2.5". 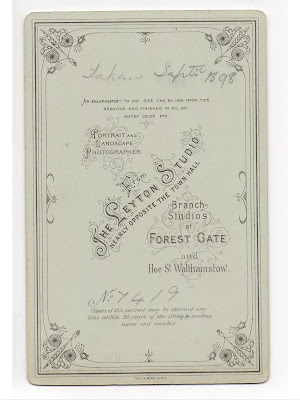 It was usual for the photographer to stamp his name, or that of the studio on the front frame of the photos, and give details of the firm, or its other branches on the back - see examples shown here. 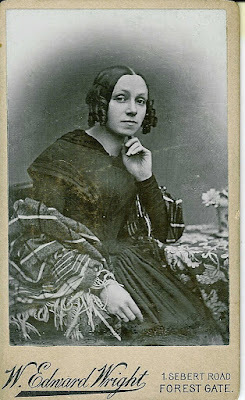 The CDV form of photography was popularised during the American Civil War (1860's), as the photos were easier to take than previous, earlier methods of photography. The subjects in the early CDVs still needed to stay still for a considerable length of exposure time in the early photos. Their popularity soon spread to Europe, in what became the beginnings of mass photography. Initially CDVs were rather stilted, posed head and shoulder shots of their subjects, because of the length of exposure times required and the lack of inventiveness of the early photographers. 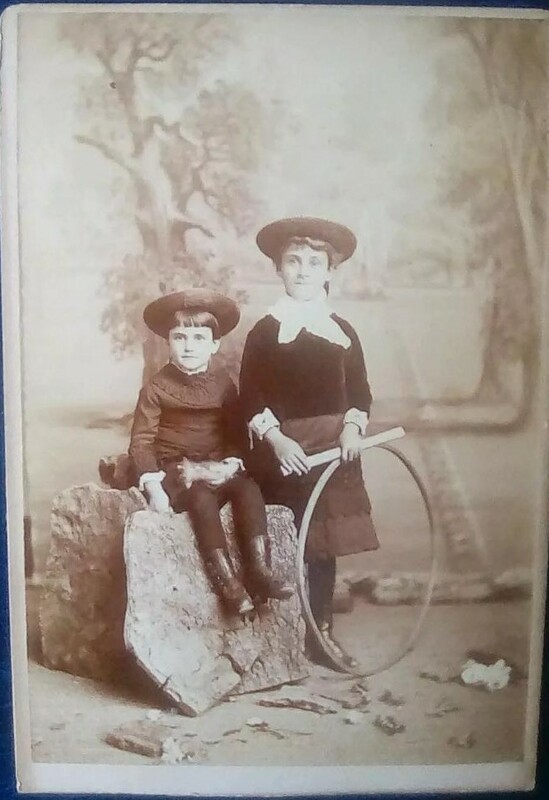 By Wright's time, however, photographers could be more adventurous, with full length body poses, props, group shots and other gimmicks, to make them appear more interesting and alive. 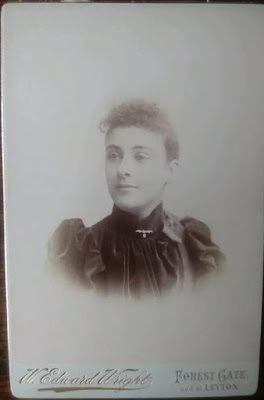 Although many survive, unfortunately few still have the name of the subject on them, and none of Wright's business records would appear to have survived, to assist the process of identifying them. Some photographers dated their photos - but Wright did not, although some pencil markings on the back of some of his (presumably by one-time owners, or subjects) help. 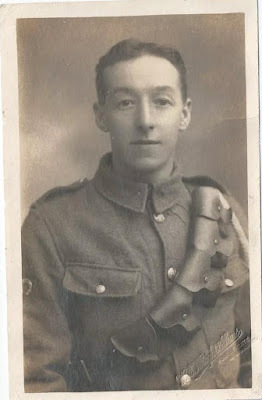 The majority of the photographs illustrated towards the end of this post are CDVs. More fashion-conscious people than us may also be able to date the CDVs with reference to the clothes worn by the subjects. William Wright, of course, produced more than simple, high turnover, CDVs, and some of his output has a wider significance. Unsurprisingly he produced a number of innovative photographs of members of his family - reproduced and annotated by his great grand-daughter, Chris, see below. 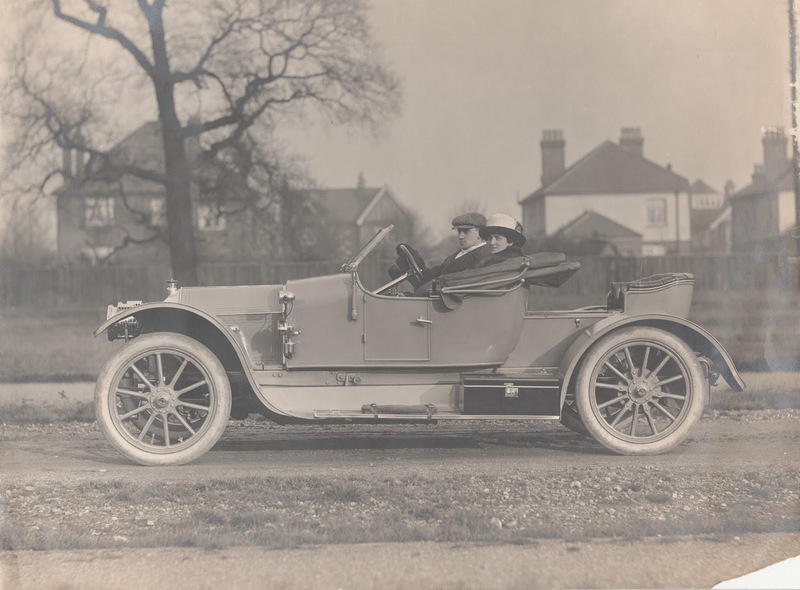 He clearly liked to own and ride impressive vehicles! (see above). 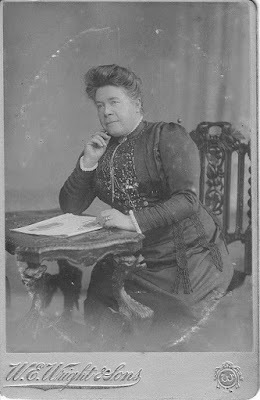 Wright also adopted the CDV style with items, such as postcards. See below one he took of Godwin school pupils, in the 1880's. 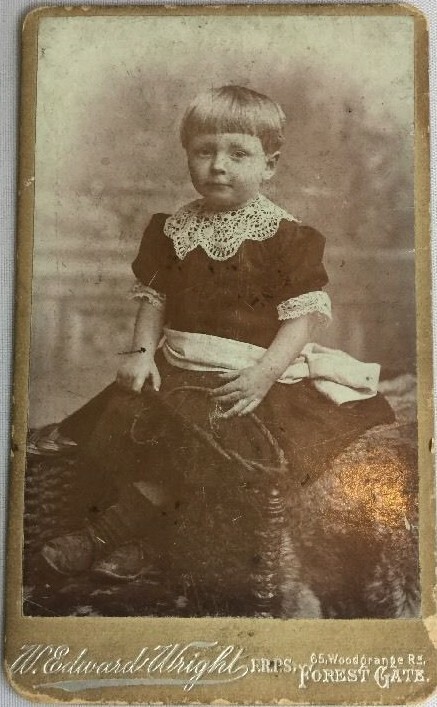 It is unlikely that he would have got the kind of sales from photos like this that school photographers get today - but doubtless it was a useful money maker (lots of potential sales from one shot). school. - see below A rare little local find! 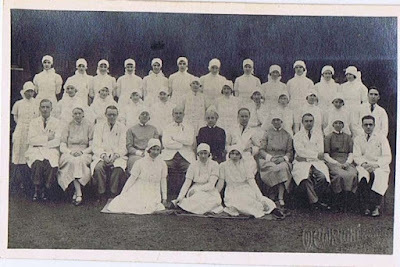 Another example of multi-sales group photography is to be seen in the undated one of local nurses, below. Unfortunately, although we know the shot was taken by the Wright studios, locally, we don't not know which hospital it relates to. The old maternity hospital on Forest Lane must, at least be a possibility. The photo, below of the Black Sateens may have been another such photograph, or possibly a publicity shot for a vaudeville act. 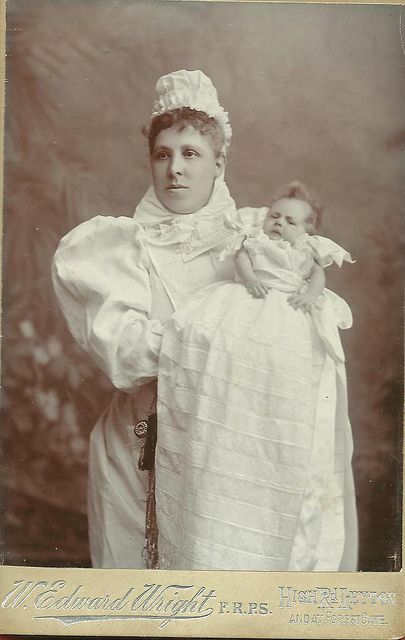 Unfortunately, we have no further information about either the photograph, of the Sateens. 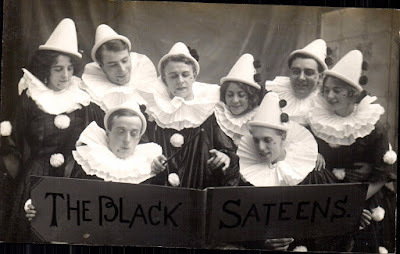 - a vaudeville or musical act, perhaps? 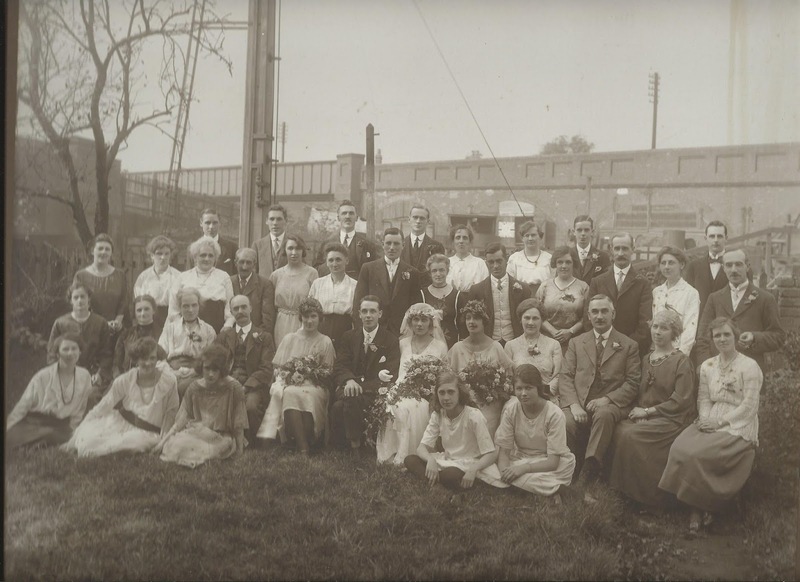 William Edward Wright also branched out into group family photography, of which weddings were perhaps the most regular and lucrative. The wedding photo immediately below was given to this website by someone who saw it dumped in a local fly tip, recently! 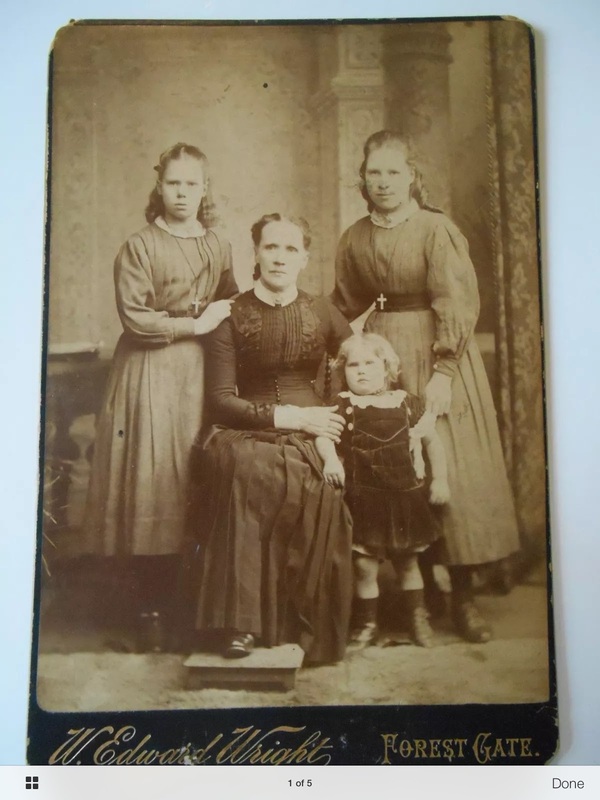 It is large - 12" x 10" inches - and the group pose is great. But the back-drop, with pylons and a railway and bridge is hardly the ideal setting for such an occasion! spoiled by the railway bridge in the background. Perhaps taken in the studio yard at Sebert Road? In many descriptions of the work of Wright's studios he is described as an architectural photographer. Unfortunately no examples of this seem to have survived - or at least have not found their way to the family collection. Any sightings or offers would be gratefully received! 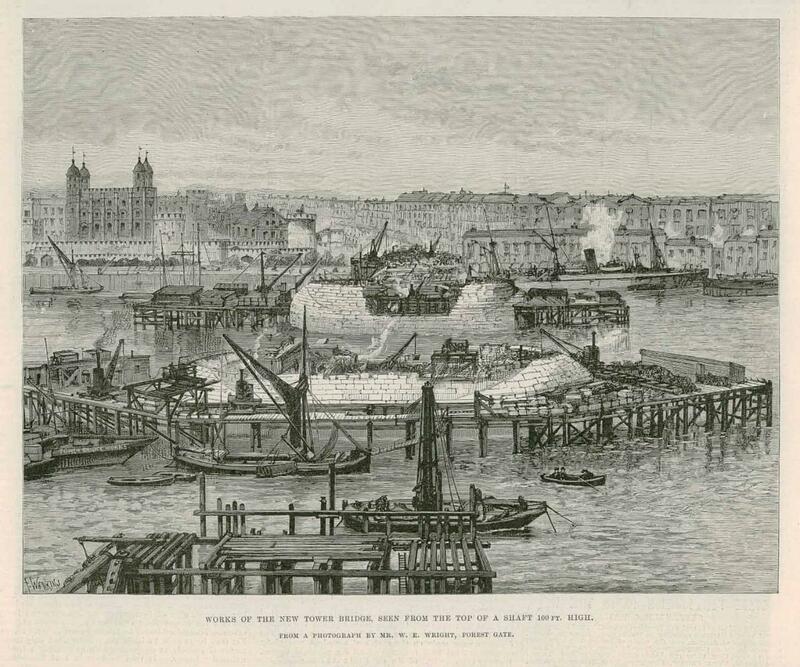 Other of his work was put to interesting uses, like the etching of the new Tower Bridge, under construction, below. 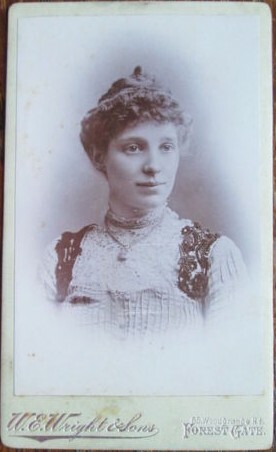 It was used by the London Illustrated News, from a photograph of Wright's, in the 1890's, when newspapers were unable to reproduce actual photographs. 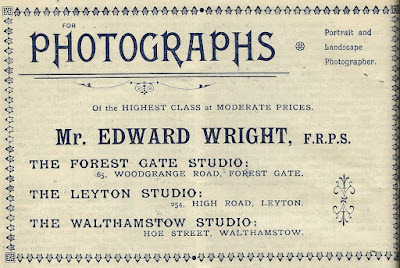 William Wright was undoubtedly a photographic innovator in his day - he was made Fellow of the Royal Photographic Society - and a successful businessman, judging by the numbers of branches of his studios he established. He and Sarah spent their last years in Torquay. Although he died, aged 79 - perhaps fittingly in West Ham - in 1931. He was probably visiting a local friend or relative at the time. W Edward Wright's active time as a photographer covered both the Boer and First World wars. 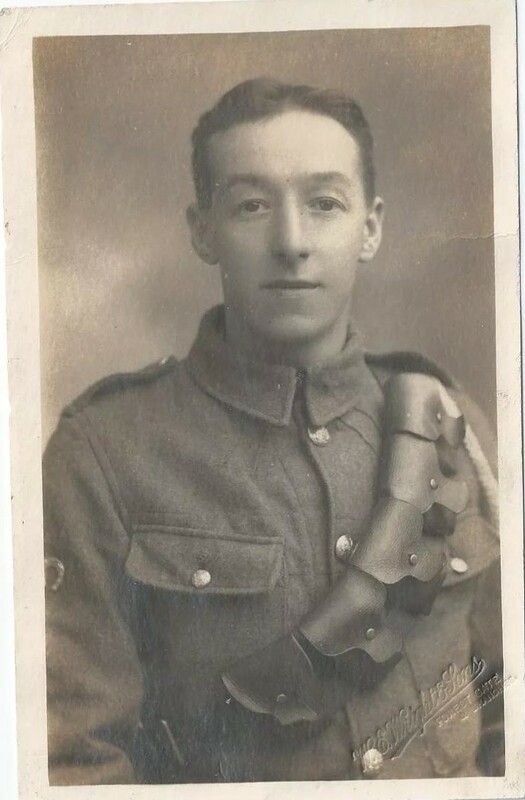 Then, as now, it was common for departing servicemen to have studio photos taken - often in uniform - as reminders, and unspoken of potential last images, for the families left behind. A fair number of these survive, a selection is shown below. Unfortunately, few have names - we have added them, where they are available. 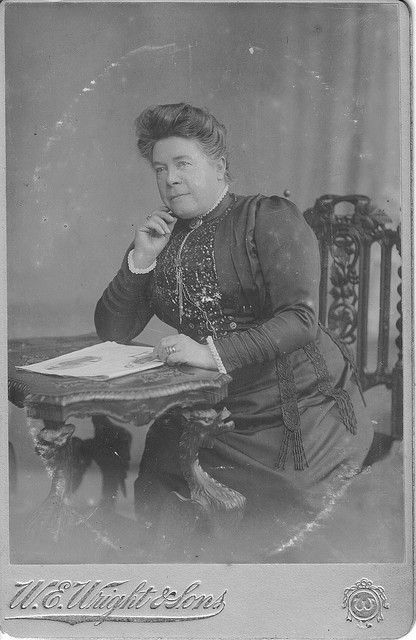 As a photographer of some distinction, Wright was called upon to take photos of a number of dignitaries. Scant details of some of them survive, but they may well be recognised by visitors to this site. A large number of these survive, today: what follows is a selection of the more interesting Forest Gate ones. A speciality for as long as photography has existed - and Wright was no exception in producing these. Again - literally dozens to choose from, but here is a selection of the more interesting Forest Gate ones. Some of the subjects clearly presented a problem for the Wright family is showing them in their best light, as some of the following perhaps indicate! 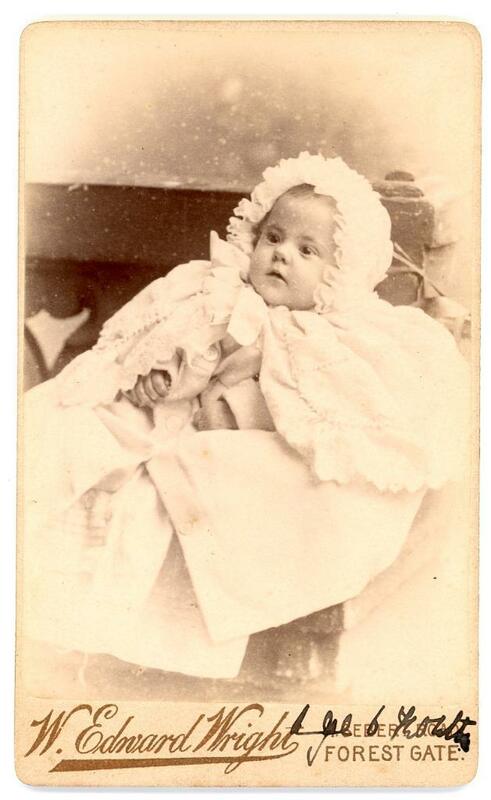 Footnote Thanks to William's great-grand daughter, Chris Roach for sharing some of the images with us. 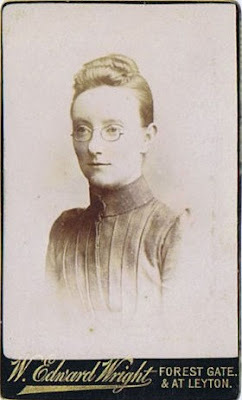 Should any visitor to this blog have more information about William and his photography - particularly the subjects of the anonymous ones here - she and I would be delighted to hear from you. 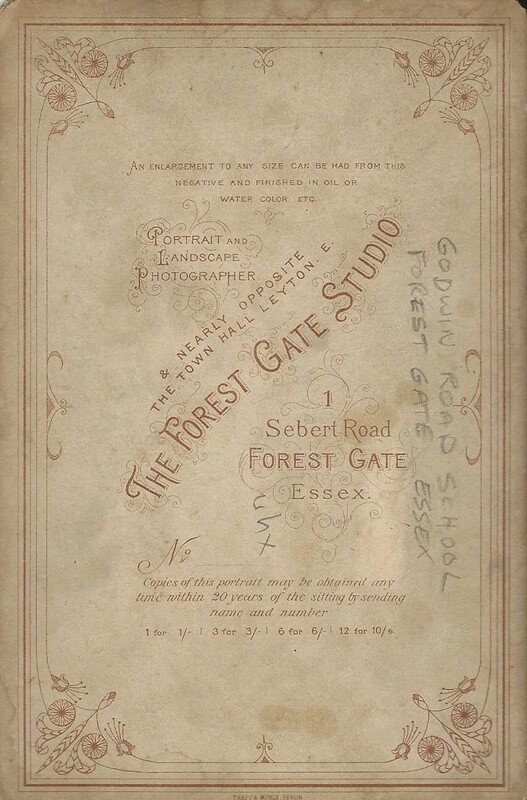 We hope to be able to mount an exhibition of the work of William Edward Wright in Forest Gate later this year.